A bold, modern, innovative brand, FlyFoe isn't your average "joe". Take a look at the other franchisors and you will find a sea of sameness. They all have similar sounding Mosquito XYZ names and have nearly identical operations and value propositions. We have built FlyFoe to be different. You should expect more from your mosquito and tick control franchisor, we're sure you'll get more with FlyFoe. I feel FlyFoe stands out from the crowd with their branding and with their exceptional franchise experience. Compare and you'll quickly see why FlyFoe is a wicked smart franchise partner. We focus on building systems that allow you to continuously scale your business without getting stuck at an operational ceiling. Here's just a few of the tools franchise owners have at their disposal. FlyFoe partners with major advertising agencies to develop high-end marketing collateral and help implement marketing campaigns at the local level for each franchisee. Sales calls and prospect inquiries are directed toward our National Sales Center. Our sales team is prepared to discuss your individual pricing and service details with prospects. We’ll answer questions, sign prospects up for service, and capture payment information before passing a new client to you for scheduling. We’re not using someone else’s software to power our business. We built our own web-based, proprietary business management software that includes route optimization, automated billing, customer service management and more. As a franchise owner you receive direct support from our Home Office staff as well as our community of franchise owners. FlyFoe is part of the Zervice Group that has successfully launched hundreds of franchise locations across the United States and Canada. Your business will be backed by a team of experts who have spent their lives researching mosquitoes and ticks. These experts will help guide your business from the pesticides to the treatment plans. 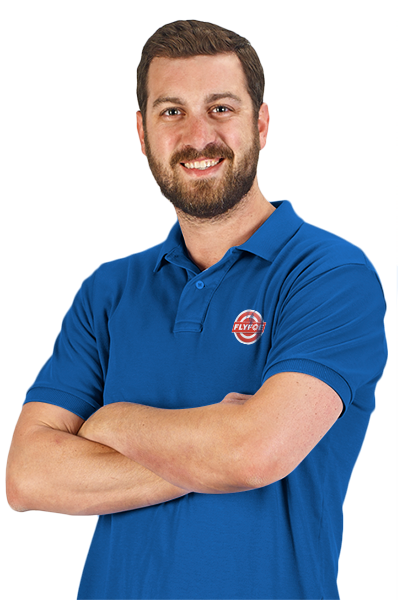 As a franchisee, it's important for you to be able to make your own choices and be competitive in your local market. While we have our set model, we know where our systems should begin, end, and when we should allow our franchisees the freedom to make their own decisions. Here are some examples. We're not sure why almost every franchisor requires weekly payments when virtually no other businesses do that. At FlyFoe, we send our invoices out after the end of the month allowing you a full month to pay. At FlyFoe, we have a 90 day out clause. If, for whatever reason, you no longer want to be in business, we won't spend the remaining 10 years collecting minimum royalty payments from you. We don't make you spend your time touring people around their own yards. Online booking is a quick and easy way to build your recurring customer base. FlyFoe is an excellent opportunity for an individual to live out their small business dream by being part of a home service that helps families enjoy their lives.